His timeless music endures as many continue to relate to his success, failure. On his 75th birthday, Elvis lives on in hearts of fans: His timeless music endures as many continue to relate to his success, failure. Elvis Presley’s pompadour is not carved into Mount Rushmore. He never dressed up as Uncle Sam to sing “Hound Dog” or “Love Me Tender.” His cherubic likeness does not grace U.S. currency. 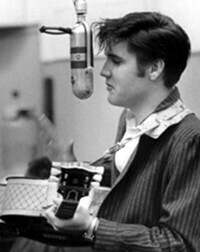 Yet there are few iconic images that are as quintessentially American as Elvis: the swiveling hips, the unlikely devotion to both rockabilly and gospel, the carefree movies, the Las Vegas monarchy, the millions of records, “The Ed Sullivan Show,” the military service, the photo with Richard Nixon, the sad and too soon finale. Michael Ventre of msnbc investigates Elvis' endurance. 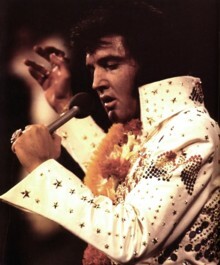 Yet there are few iconic images that are as quintessentially American as Elvis: the swiveling hips, the unlikely devotion to both rockabilly and gospel, the carefree movies, the Las Vegas monarchy, the millions of records, “The Ed Sullivan Show,” the military service, the photo with Richard Nixon, the sad and too soon finale. And with his 75th birthday on Jan. 8, memories of Elvis gyrate through the collective consciousness like the American Dream personified. But is the man who created such a cultural ruckus in 1956 by introducing black music to white audiences as relevant in 2010? 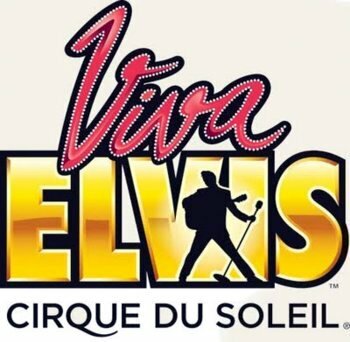 Is Elvis simply “The King” in name only, out of respect? Or does he still reign? To Gordon, the hair, the face, the guitar, the pelvis, they’re all secondary. It’s the music that keeps Elvis Presley alive in the minds of millions. After all, the man had 114 top 40 hits, 18 of which alone went to No. 1 in the USA. Way more than 30 Number 1 hits if you count them all world-wide. “His music is timeless and enduring,” Gordon said. “But people also saw something of themselves in him. He lived the American Dream, and the way it ended they recognize as the American Nightmare. Larry Geller was nearby when the dream died on Aug. 16, 1977. He wasn’t just Elvis’ hairstylist, but also a close friend and a spiritual advisor who was embedded in Presley’s inner circle. Now he serves as one of the standard bearers for Elvis’ legacy. Geller was present each day to groom Elvis during most of the man’s performing life, and he was there at the mortuary, next to the casket, dying Presley’s hair with mascara borrowed from a female mortician. Geller said he reached into the casket before it was closed for the final time and was the last person to touch Elvis Presley before he was laid to rest. “Nobody looked like Elvis,” he said. “He had the most gorgeous face. He looked like he stepped out of the Bible or Greek mythology. Physically, he had the whole package. Elvis has endured, said Geller, not because he is a brand, but because he is so uniquely accessible, even to people who never had a chance to meet him. “Look where he came from: desperate poverty,” Geller said. “He rose to the highest heights that anyone could ascend to. He achieved fame and fortune. He personified America. He was daring, brash, optimistic. 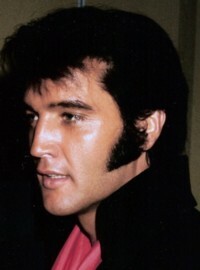 Cory Cooper said he was introduced to Elvis at about age 5 or 6, and saw the “Aloha From Hawaii” special on television in 1973. 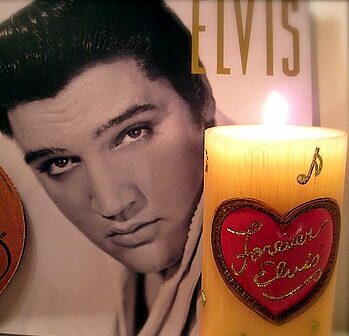 Since then, Elvis has become a happy obsession. The retired law enforcement officer from Reno, Nev., is often consulted by authors, documentarians, journalists and fans about the life of Elvis Presley. 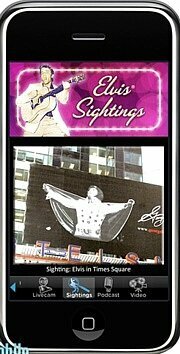 Cooper pointed to Elvis’ charisma as the magnet that draws in admirers and keeps them devoted to this day. It’s the kind that could mesmerize audiences in Las Vegas without the benefit of the dancers and pyrotechnics often seen at other Sin City extravaganzas. “He was always gracious and humble,” Cooper explained. “That was the one thing — above all the millions of other factors to like Elvis — is that he always stayed approachable. He was the biggest star in the entertainment business, yet he always took time to take pictures with people, he would go to the gates of Graceland or at his home in Los Angeles and talk to fans and invite them in. At Graceland, Kevin Kern is swamped, but in a good way. 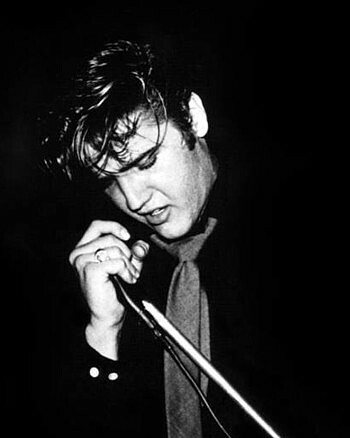 It’s Elvis’ birthday week, and the attention is almost enough to make a guy croon “Too Much.” Almost. “He changed the world. People know that,” Marcus said. “They know that in some deep and even distant way Elvis changed them, or left them a different world to live in than they would have known if he’d never lived. That’s one part of it. & with EIN thanks to Cory Cooper. Michael Ventre is a regular contributor to msnbc.com. Spotlight with images created by Piers Beagley. -Copyright EIN January 2010. Do Not reprint or republish without permission. Elvis at 75: Can we ever again see the performer, not the punch line?